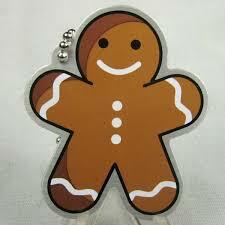 Dottie the Christmas Gingerbread Man - He certainly knows the muffin man who lives down Drury lane. Now move him along before he is eaten! All Cache Buddies are made of aluminum, just like travel bugs, and come with a chain so that it may be attached to another item. Dottie the Gingerbread measures just under 2".